It is confession time for Desert Psychlist in that we have to ashamedly admit to never hearing, or for that fact, even knowing of Vancouver, Washington stonernaut trio's Jollymon's existence, it seems however, after doing a little investigative research, that there was/is a lot of love out there for Jollymon. That love can now be reignited (or in Desert Psychlist's case, ignited) as the band, Mark Blackburn (drums) , John Colgate (guitar, vocals) and Carey Rich (bass/vocals), return this year, after an eighteen year absence, with a brand new album " Voidwalker"
Coming to Jollymon for the first time, with "Voidwalker", and having no knowledge of the bands sound prior to this release means Desert Psychlist can approach the bands new album with fresh ears, unhindered by comparisons to past glories and with no preconceptions of what a Jollymon album should actually sound like. Well if. 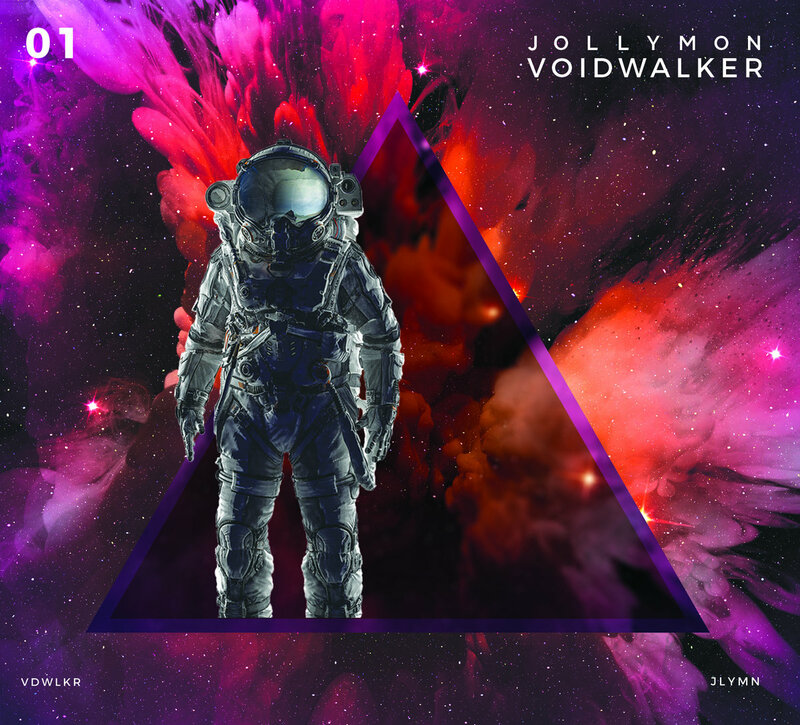 like us, you are a Jollymon virgin then your first reaction, as songs like "Tsunami", "Slice of Life" and "Missile Commander" assail your senses, will be (should be) one of awe and wonder, the albums mix of crunching riffage, progressive textures and world wide melodies, is an absolute delightful introduction to a band who not only ticks all those boxes marked stoner and hard rock but also those marked progressive, pop, funk and reggae and often all in the same song. To be able to pull off such a feat you need strong, confident and skilful musicianship and Jollymon have this in spades, Colgate's guitar soars, swoops and hovers over, in and around the superbly executed array of rhythmic grooves Rich's bass and Blackburn's drums provide for him, the guitarist as comfortable chopping out roots style reggae chords as he is searing bluesy solos and complex progressive arpeggios. Add into this mix Colgate and Rich's blend of lead and vocal harmonies on songs like "Be Nice" and "Forecast" and you arrive at sound and groove that will not only have you smiling like a cat that's found the cream but will also have you searching record stores and music web sites wanting/needing to check out all their previous work..
Followers/fans of Sheffield, UK's hard rocking groovsters Regulus might want to take a moment to check out guitarist Luke Jennings other combo Deltanaut, a mainly instrumental trio, formed with Santiago Kings bassist Niall Kingdom and fellow Regulus drummer Joe Milburn whose sound is, in Jennings words, "very much on the psychedelic end of stoner rock". 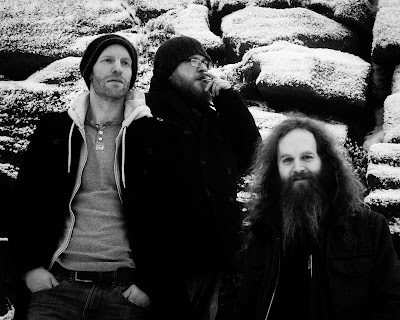 The band are about released their debut album "Part 1" on an unsuspecting world (June 29 2018) so let's see how psychedelic their end of stoner rock actually gets..
"Bells of the Skychurch" kicks things of in fine lysergic style with Jennings heavily effected guitar, sounding very much like a Jew's Harp, reverberating over a deliciously seductive Kingdom bass line superbly backed by Milburn's solid and effective drumming. Laid back and dreamy seems to be the initial vibe here but Deltanaut don't want their listeners to getting too comfortable and so into the mix they throw elements of stoner raunch, bluesy bluster and metallic crunch and it is this blend of hard rocking grit and lysergic gentleness that makes this song and the other four songs on "Part 1" such an enthralling and satisfying listen. 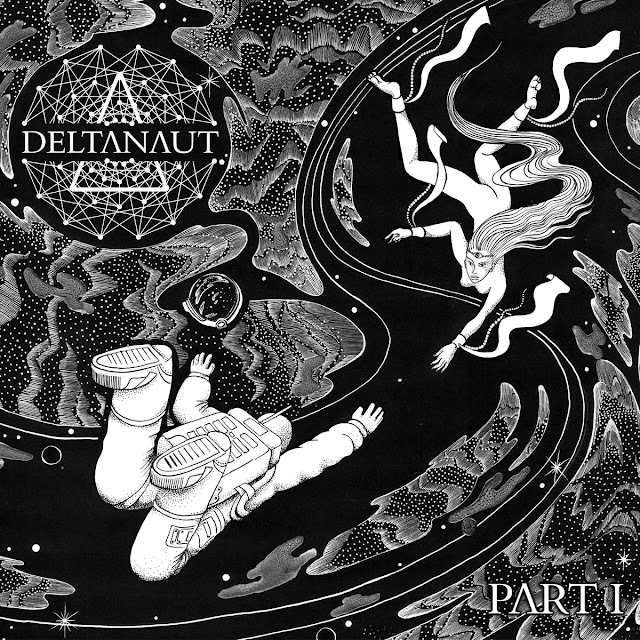 Deltanaut are not a band who put up signposts indicating the directions their songs will take, there is an unpredictable element to Deltanaut's grooves that surprises and amazes at every turn. Take "Horror Vacul" for instance, its crashing hard rock beginnings leading the listener into believing that he/she will be taken on a raucous ride of crunching riffage and punishing rhythms to a noisy final crescendo only find themselves suddenly and unexpectedly confronted, mid song, by ambient shards of chordal colouring, liquid bass and jazzy percussion with no prior indication beforehand that this would be the case. The band repeat this trick on "Jam ∞", "Deltanaut" and "Sorceress" to great effect, pulling the listener in one direction then suddenly yanking them in another the next and in doing so maintaining the listeners interest and underlining the fact that with this band you cannot take anything for granted. Beautiful, brittle, bruising and brilliant are all descriptions you could throw at "Part 1" and each one has its place somewhere on this sprawling and quite wonderful release. Deltanaut's end of stoner rock is, on the evidence here, very psychedelic indeed. Music delivered within the confines of the desert/psych/doom scene is often judged on the power of its riffs, how many times have we heard someone mention "the power of the riff" or post "all hail the riff" on social media? Strangely when an album comes along brimming over with said riffage, minus any vocal contributions, many of those same people bemoan the lack of a vocalist, we live in strange times people. However, for those who like their riffage occasionally unadorned by vocal pyrotechnics or guttural growling there are a few really good bands out there whose whole reason for existence is to bring those riffs to the fore and truly celebrate their power. Brugge trio Atomic Vulture, Pascal David (guitar), Kris Hoornaert (bass) and Jens Van Hollebeke (drums), are one such band and having already wowed and amazed us with their stunning instrumental debut "Into Orbit" they are now about to blow us away once again with their second release "Stone of the Fifth Sun". 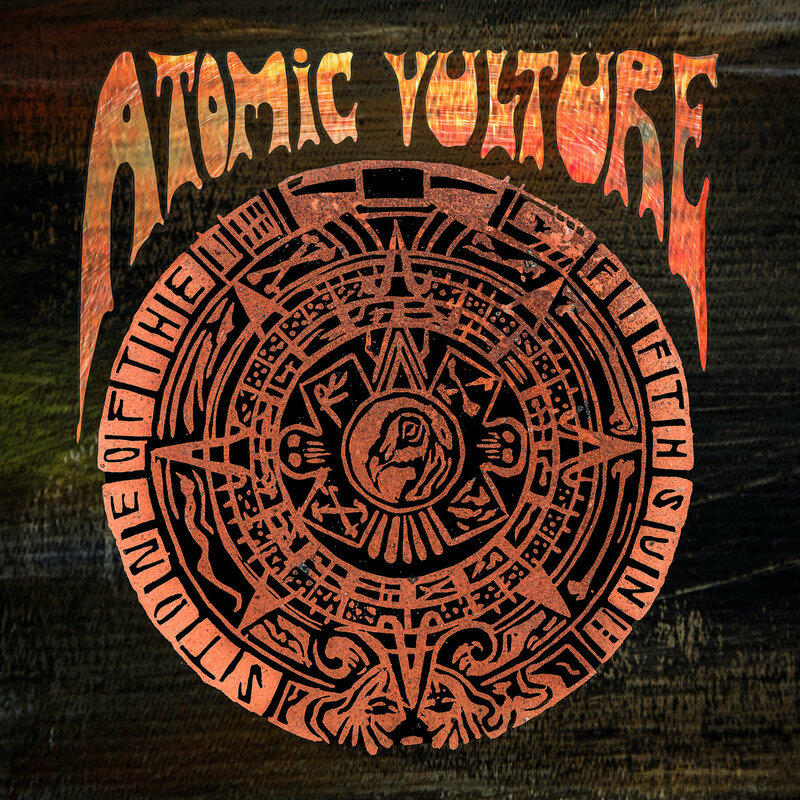 To be fair to Atomic Vulture the sound they create together is an not unending stream of bass and guitar refrains piled one on top of the other, there is much more depth and complexity to be found here amidst the crunching chords, growling bass and pummelling percussion that inhabits much of "Stone of the Fifth Sun". First track "Jaguar" is a prime example of the blend of crunch and complexity that is Atomic Vulture's modus operandi, and sees guitarist David firing off a stream circular refrains and swirling lead work over,in and around a virtual tsunami of groove expertly provided by Hollebeke's powerful, insistent percussion and Hoornaert's grizzled, growling fuzz drenched bass. 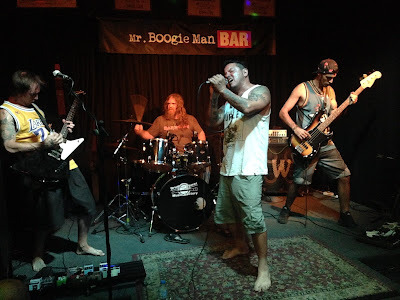 "Wind" then follows and the lysergic aspects and elements touched on in the previous track are expanded a little further, this time underpinned by touch of desert flavoured grooviness and melancholic bluesiness, Did we mention Atomic Vulture bill themselves as an instrumental band? Well next track "Rain" blows that statement out of the water with a stonkin' desert/hard rock groove coated in clean, strong and superbly executed VOCALS! 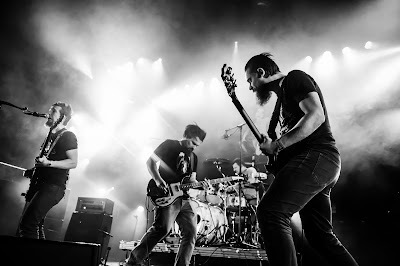 "Water" finds the band back in instrumental mode jamming a slightly eastern tinted groove replete with exotic scales and motifs before Hoornaert's deliciously effective bass line leads them off on a tangent into heavy psych territory. 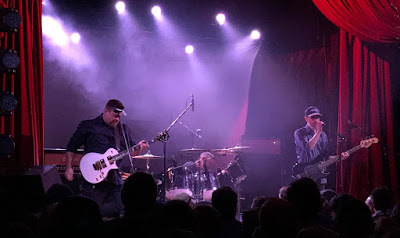 "Earthquake" then closes things with the band hitting a groove that is part Kyuss, part Earthless and part Colour Haze yet despite this is totally and wholly ALL Atomic Vulture. Australia has given birth to some of the dirtiest, raunchiest rock music known to man, whether this is due to its diverse climates and geology or the fact that everything found living in its vast array of deserts, bushes, streams and seas seems intent on killing you, Desert Psychlist doesn't know, but there is a certain grittiness and raunch to the music coming out of that country that is unlike any found anywhere else. Stone Djoser, Camo (drums), Jesse Rat (bass guitar), Vik Torr (vocals) and Josh Rat (guitar), are not, by any means an exception to this rule the quartet having the raunch factor of, fellow Aussie hard rockers, Electric Mary and the gritty bluster of cult proto-metallists Buffalo, all sprinkled with a little stoner fuzz and desert distortion, just check out the bands debut album "Stone Djoser" for confirmation. Deep, thought provoking grooves, with meaningful lyrics that have you gazing at your navel and considering your place in the scheme of things, are all well and good but music needs to celebrate as much as it does to contemplate and Stone Djoser provide the perfect soundtrack for doing just that. Rock'n'roll is, these days, seen as a bit of an outdated term to describe music but rock'n'roll is exactly what these Bendigo bruisers bring to the table, the band delivering old school hard rock grooves ladled with a little new school aggression and attitude. From the first droning note of "Pay For Free" to the final drum beat of "Better Off Dead" Stoner Djoser treat the listener to an almost non-stop onslaught of raucousness and gritty groove, stopping only briefly to allow you to catch your breath with the power ballad(ish) "Leave It All Alone", and even then the band cannot help but throw in some good old fashioned raunch to pepper things up. 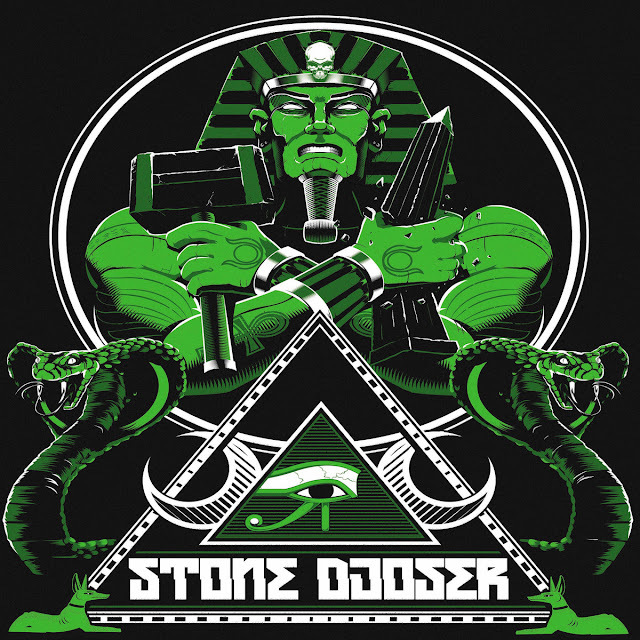 Strong powerful, throaty vocals roared over big crunching riffs and crashing percussion are the order of the day throughout "Stone Djoser", it is a day filled with fun, fuzz and furiosity and sometimes those days are all you really need. 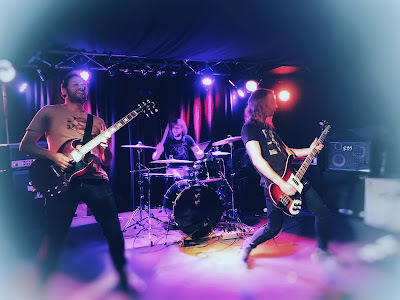 So put away your Socrates and Nietzsche, grab a beer and something to smoke and just enjoy the tsunami of raucous groove the band provide with "Stone Djoser", these guys are not here to change your world, they are here to ROCK it! 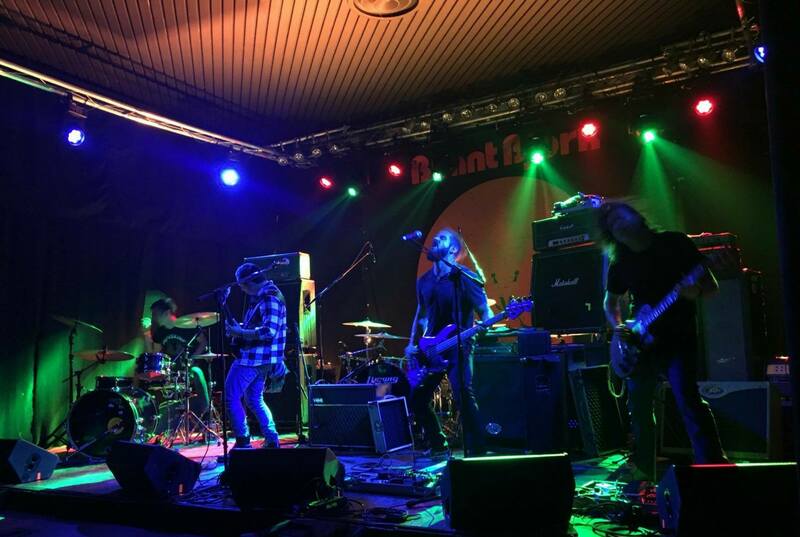 Any band who mentions UK doom/NWOBHM band Pagan Altar in their list of influences is going to draw Desert Psychlist's attention and the fact that the band doing the mentioning also cite Wishbone Ash and 70's era Scorpions as influences also does nothing but further peak our interest. The band in question,a quintet from Baltimore, Maryland going by the name Alms, consisting of Andrew Harris (bass), Bob Sweeney (guitar, vocals), Derrick Hans (drums), Jess Kamen (keyboard, vocals) and Danny McDonald (guitar), recently convened at Developing Nations Studio to record their debut album the results of which are now available via Shadow Kingdom Records and Bandcamp. Keyboards used correctly in rock music can transform a bands sound dramatically, giving the grooves, delivered by the usual couplings of vocals,drums, bass and guitar, an extra dimension and depth. Alms use keyboards on "Act One" to great effect, their vocalist/keys player Jess Kamen comping behind a riff one minute, swirling in and out of the groove with swathes of textured keyboard colouring the next, however it would be wrong and a little misleading to call Alms a keyboard driven band as there is so much more going on here. 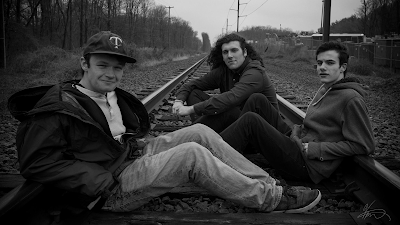 The first thing you notice when giving "Act One" a spin is that these guys have SONGS. 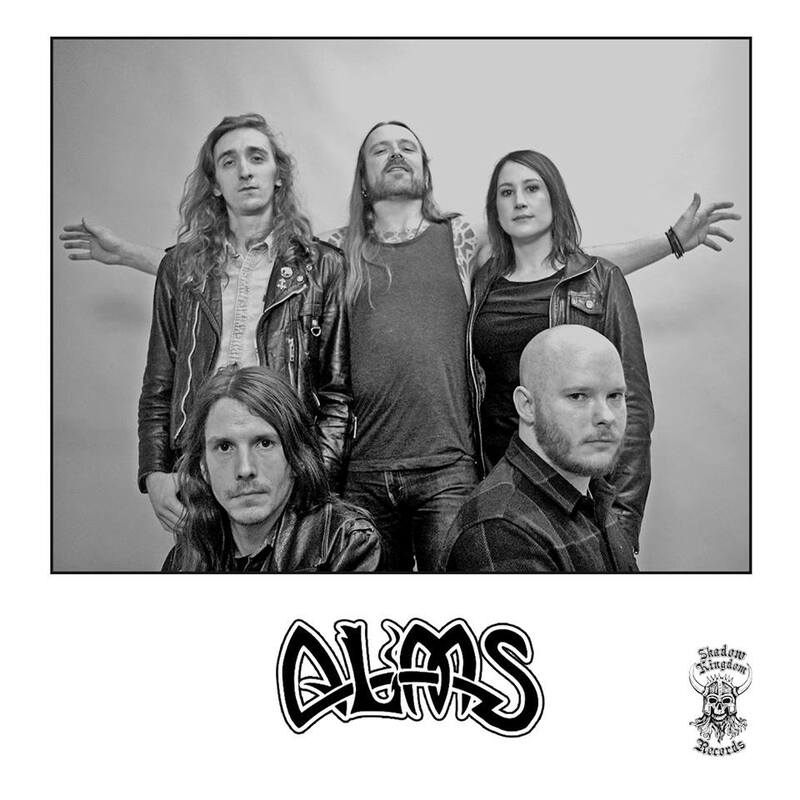 Alms are not just another run of the mill riff machine, although there are plenty riffs here to enjoy, these guys have melodies, harmonies and arrangements to spare and are unafraid to use them. Opening track "Dead Water" is a perfect example of Alms manifesto of musical substance over riff based content, its doomic/occult,almost cinematic keyboard heavy, groove is counterbalanced by Sweeney and Kamen's superb dual harmonies over a pop like, swinging melody, creating an overall groove that is as dank as it is deliciously delightful. This intoxicating blend of bright swinging vocal melodies and dank, dark groove is repeated throughout "Act One" and sees Hans and Harris supplying a diverse array of rhythmic platforms for McDonald and Sweeney to decorate with swirling lead work and crunching doomic refrains, Kamen's keyboards, swirling in around the grooves, the icing on what is a very tasty and totally moreish musical cake. Belgium's Fire Down Below refer to themselves as "amp-hugging, hard-hitting, fuzz-loving, ear-splitting, riff-worshipping rock 'n rollers", it is a bold claim but one the band, Sam Nuytens (drums)Jeroen Van Troyen (rhythm guitar and vocals), Kevin Gernaey (lead guitar) and Bert Wynsberghe (bass guitar), can more than back up, as can be witnessed by giving their latest release "Hymn of the Cosmic Man" (Ripple Music) a spin. The word "cosmic" is well used in this albums title as the album has very much a space related theme running through its songs, titles like "Red Giant", "Ignition/Space Cruiser", "The Cosmic Pilgrim", "Nebula" and "Adrift in a Sea of Stars" are scattered liberally over the album length and even those songs with no reference to the vast Cosmos in their titles, " Saviour of Man" and "Ascension", are lyrically concerned with the great unknown and our place within it. What we all come to an album for however is the music and even if you have the most mind blowing concept for your album if the music does not match the integrity of your themes/concepts then you are more or less sunk before you have begun. Thankfully Fire Down Below's grooves are more than a match for their lofty conceptual aspirations and deliver both musically and lyrically within their spacial structures, the band rocking and vibrant on "Ignition/Space Cruiser", tranquil and trippy on "Nebula" and even a little prog(ish) and Tool like on the superb "Ascension". 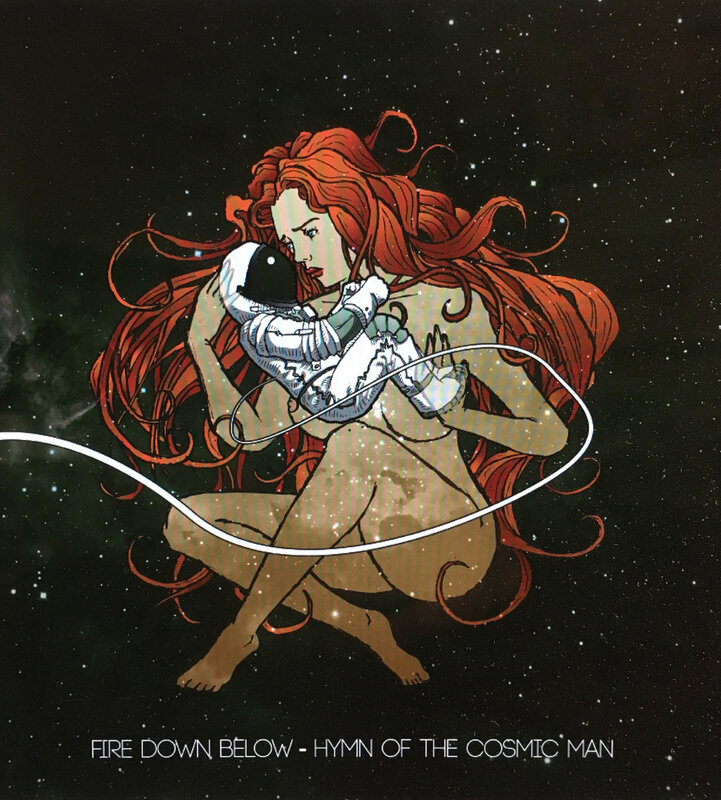 Overall "Hymn of the Cosmic Man" is a superb follow up to the bands excellent debut "Viper Vixen Goddess Saint" and is an album that shows Fire Down Below are a band who are slowly evolving into something very special indeed. 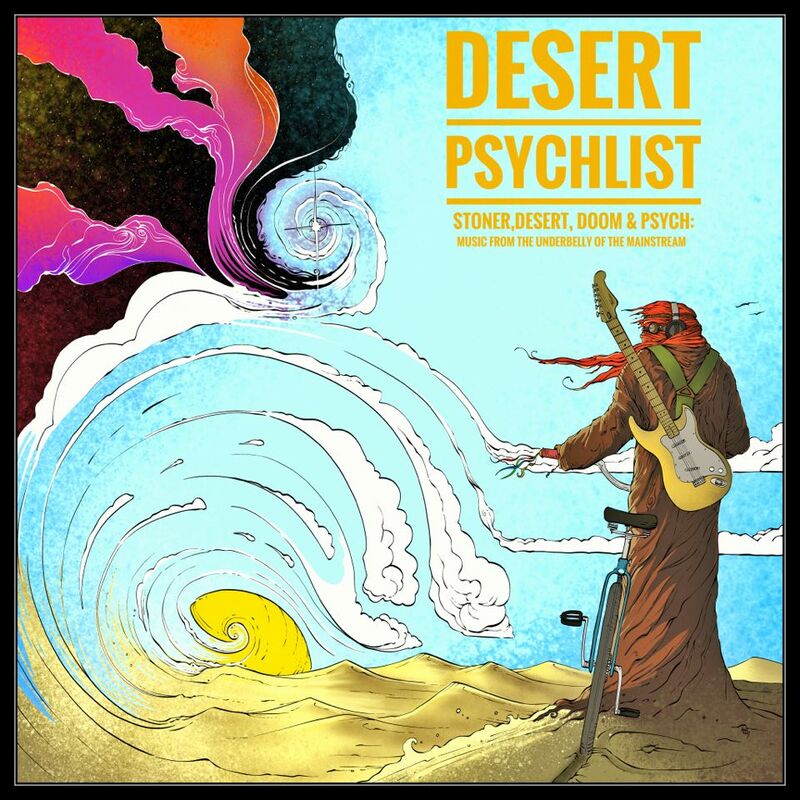 There must be those out there who are starting to believe Desert Psychlist has some sort of obsession with the Greek stoner/hard rock scene as, over the few years we have been active, we seem to have covered a good many Grecian bands on these pages. The truth is, however, that with so many good bands and so much good music coming out of Greece at the present time it would be just too damn hard NOT to feature an album/band from that country. 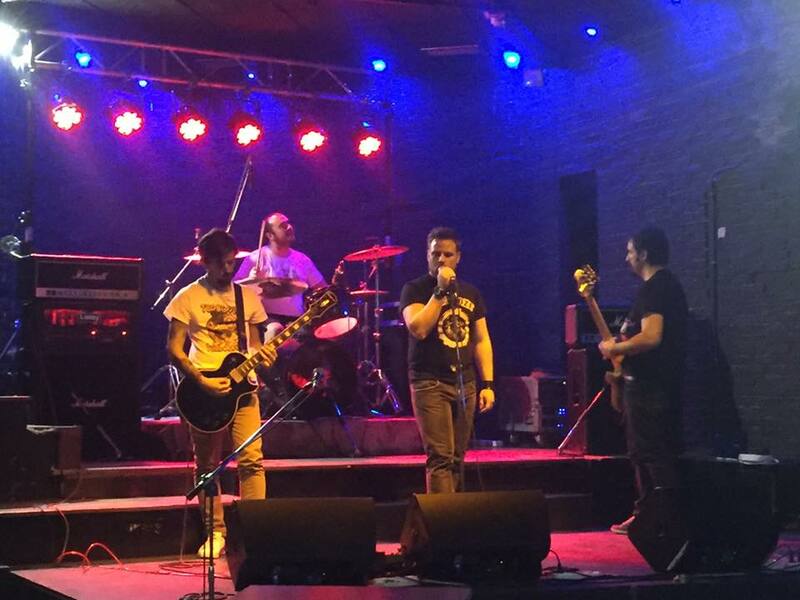 One band who Desert Psychlist has not covered on these pages hails from Kalamata, Southern Hellas consisting of Dimitris Diamandis (vocals), Yiorgos Mpelos (guitar), George Mountaneas (bass) and Stathis Bar (drums), a band of bearded desperados flying under the collective banner of Mr. Booze. The band. 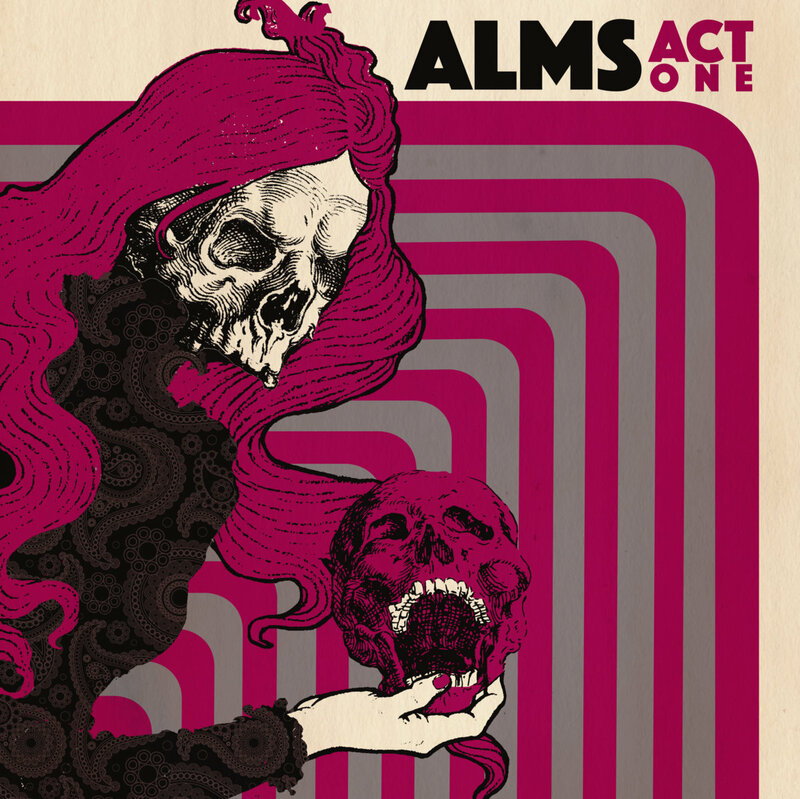 who have released two previous albums, "Greetings From The Middle Finger" (2012) and "Dance At Your Own Risk" (2015), and have shared stages with such Greek hard rock/stoner luminaires as 1000 Mods and Planet of Zeus, have just released their third album, a stonking collection of fuzz drenched raucousness and doomic riffery entitled "The Mourning Hypocrites"
The one common denominator among many Greek underground bands seems to be their predilection for adding, to their crunching riffage and thundering rhythms, a certain element of southern rock/metal swagger and swing. 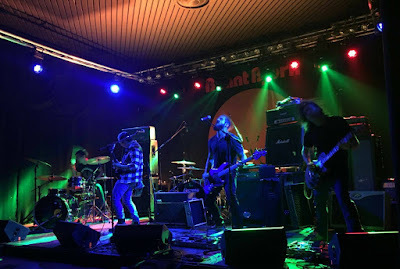 Mr Booze are no exception to this rule but where Mr Booze differ from their Greek contemporaries is in the doomic elements the band bring to the table, retaining the southern swagger that almost seems to be a prerequisite in Greek rock, but adding to it a darker, danker edge. This darker edged vibe is prevalent from the very first track "✝", the snippet of sampled dialogue that announces the tracks arrival telling us to "fasten your seatbelts, it's gonna be a bumpy night" is the perfect introduction to an album that both crushes and rocks in equal measure. 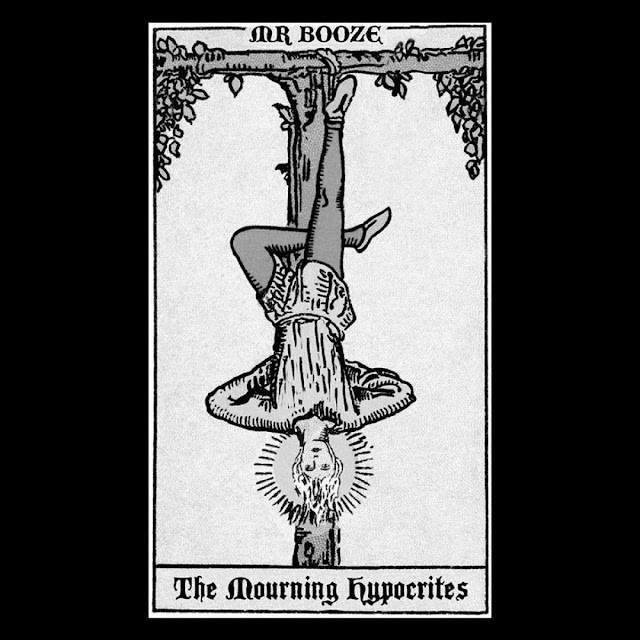 Each song on "The Mourning Hypocrite" is like a little dark vignette telling tales of despair and desolution all perfectly executed by a band who have learnt their craft supporting some of Greece's finest underground combo's. Drummer Bar's mix of restrained intricacy and brutal power sits at the root of Mr. Booze's sonic attack, the percussionist locking in with Mountaneas' grumbling, growling bass to build diverse platforms of groove for guitarist Mpelo's to decorate with a mixture of crunching down tuned riffage and soaring lead work, the three musicians creating the perfect musical frameworks to portray and display Diamandis' strong, distinctive vocals, the front man able to go from throaty stoner drawl to full on heavy metal howl with consummate ease, his range and tone giving lyrics like "hear the hounds scratching at my door, smells like their fear has settled on the floor" an extra level of impact and gravitas. From the aforementioned "✝", with it's swinging vocal melody and menacing groove. through to the ever shifting proto bluster of "Mourning" there is an underlying feeling of danger and unpredictably to the seven songs on "The Mourning Hypocrite" a feeling that is akin to living near a dormant volcano, you know it is going to erupt, you just don't know when! What's in a name? Well if your band started life flying under the banner Monolith only to find out later that there are at least a gazillion and one other "Monolith's" doing the rounds, then Desert Psychlist expects quite a lot, especially after you've released two EP's and an album under that name. Still these things happen and having realised their predicament the quartet from Modena, Italy have added the word "Grows!" to their title. 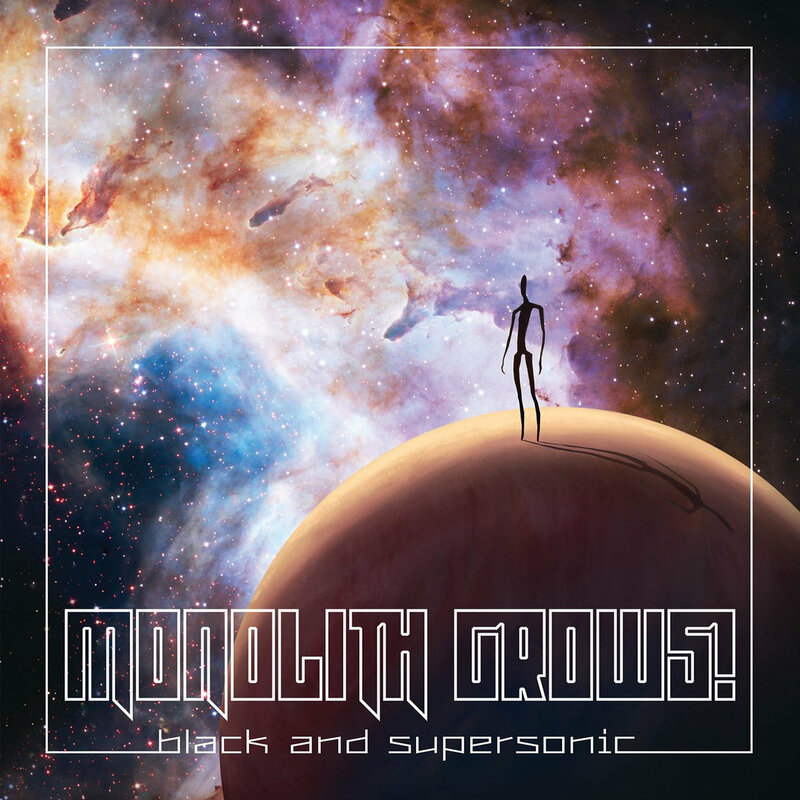 It's the same band, the same sound but with a slightly longer name, just check out their new release "Black and Supersonic" (Burning Wax Productions) if you need reassurance. 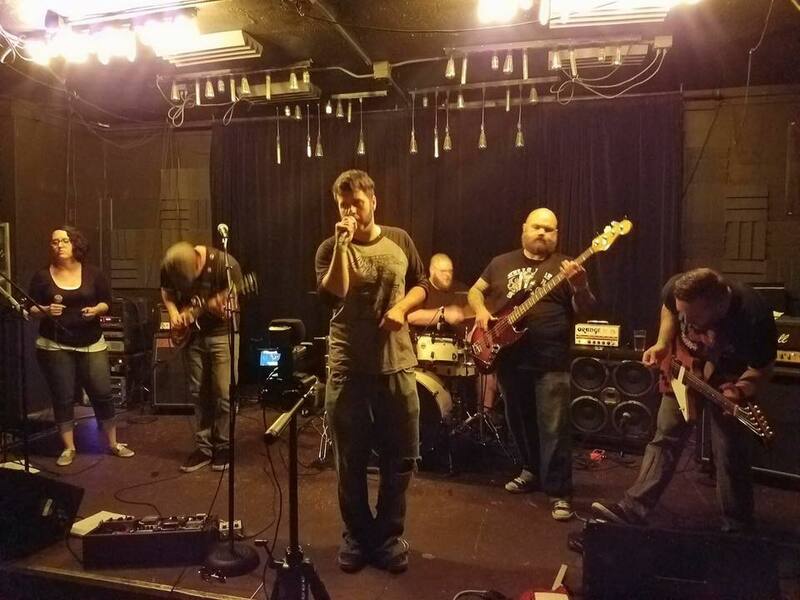 Part heavy metal rockers, part fuzz driven stoners and part angsty grunge groovesters Monolith Grows! are a band who cover a lot of bases and cover them all well. It might seem, from someone looking in from the outside, that a band incorporating so many styles and elements into their sound would have to make certain musical compromises to accommodate them all but thankfully this is not the case. Monolith Grows!, Andrea Marzoli (guitar/vocals), Enrico Busi (bass/vocals), Massimiliano Codeluppi (guitar) and Riccardo Becero Cocetti (percussion), manage to swing back and forth between Alice In Chains-like slurring grooviness on "Ultraviolet In The Clear Sky" and " Low", to Kyuss/QOTSA-esque quirky desert swagger, "You're Gone","Satan Monday Bureau"(featuring House of Broken Promises Joe Mora) and "So Fresh", while on the way touching on old school classic rock and metal with "Here Comes The Hero", Silly Gods" and "Above the Doubts", managing to inject elements from all these influences and more into their grooves without ever losing sight their own unique sound, even when stepping outside of the box, as on the ambient "Interlude With Synths and Clean Guitar". The Nirvana-esque "Empire of Dirt" that closes proceedings rounds up ,what is for Desert Psychlist, a very interesting and highly enjoyable album and an opus that will resonate with many of those listeners brought to today's heavy underground music via Seattle's mid eighties/early nineties alt/grunge scene. Concept albums inspired by novels are usually heady, intellectual affairs full of deep meaning and serious thought, with not a lot of room for humour. Mississippi Bones do not adhere to that train of thought however, and when the six piece stoner rockers from Ada, Ohio, decided to tackle a concept they chose to base it around Jonathan Raab's "The Hillbilly Moonshine Massacre", one of the craziest, funniest, surreal novels ever set to print, and to write it from the perspective of one of the novel's main characters, Sheriff Cecil Kotto, and his conspiracy theory radio show. 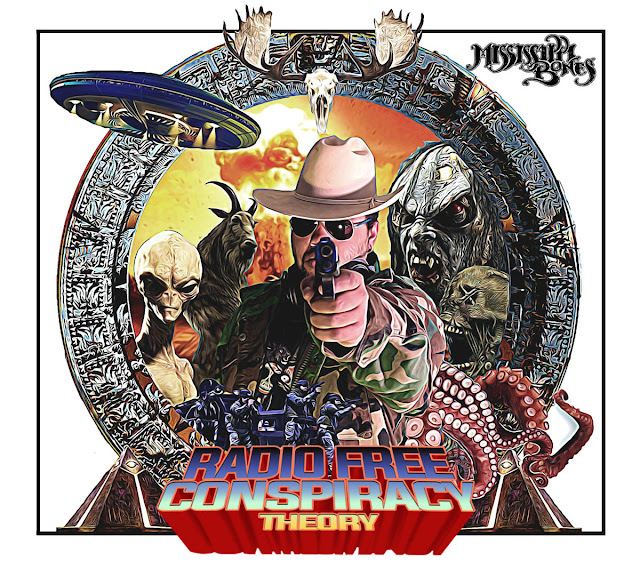 This is "Radio Free Conspiracy Theory" grab a beer, relax and let Mississippi Bones treat you to one of the funniest, rockiest concepts albums ever recorded. Structured as "live" broadcast, with Sheriff Kotto airing his thoughts on various conspiracies and theories, hosting a phone in while also trying to deal with a real life X-files like crisis happening on his own doorstep, "Radio Free Conspiracy Theory" is a masterpiece of audial storytelling and musical execution that sees Mississippi Bones supplying the musical interludes to Kotto's DJ'ing, theorising and general all round Earth saving. The fact that Mississippi Bones drafted in the novelist Jonathan Raab to help write the "radio" passages between each song, as well as employing a whole slew of actors to voice the various characters phoning in, adds a whole new dimension to this project. However this project would not work without the excellent southern tinted stonerized grooves Mississippi Bones interrupt Kotto's musings and theories with, and while we are talking about the music, let's address the elephant in the room and get one thing out of the way before we start. The criticism that is bound to be levelled at this album, and for that matter Mississippi Bones sound in general, is that they sound both dynamically, musically and vocally similar to Clutch, there is no getting away from this, those similarities are undeniably there for all to hear, and so the best thing to do is either accept the fact, and enjoy what Mississippi Bones do, or go find something else to listen to. Desert Psychlist highly recommends doing the former, let's face it who could not love a band, who in a song called "101 Ways To Cook A Human", insert the lyric "They call us monsters, but who cares what dinner thinks? " 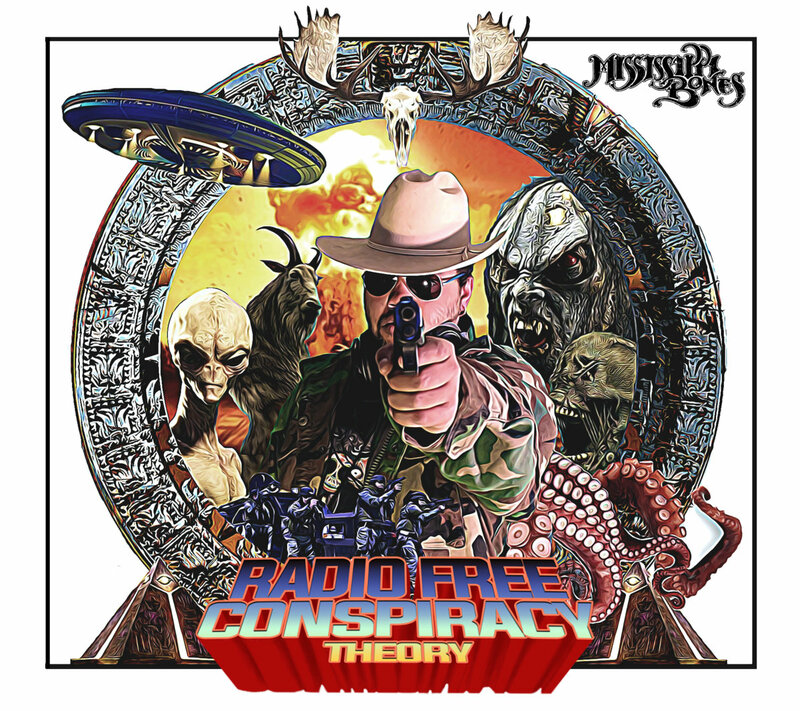 Do yourselves a favour, put aside your Clutch sized reservations and just enjoy Mississippi Bones' "Radio Free Conspiracy Theory" for what it is, a damn fine rock record based around a brilliantly funny and thought provoking concept that combines both story and music in a unique and highly enjoyable way. 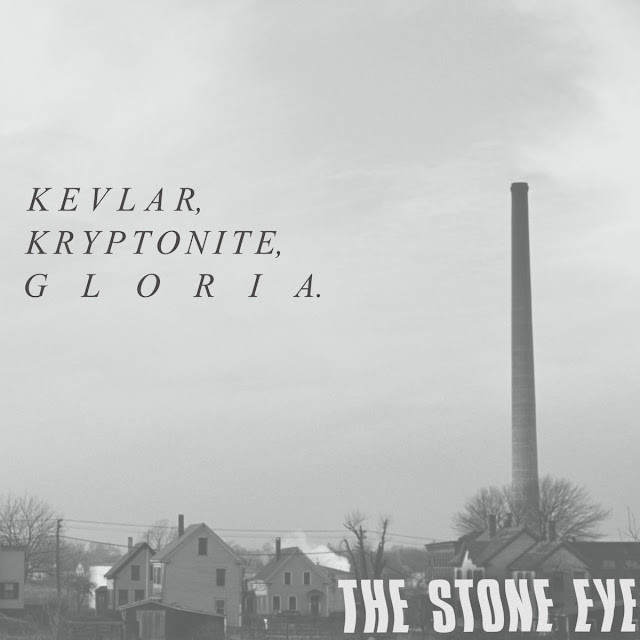 Philidelphia's The Stone Eye don't mess about, less than a year from the release of their third album "The Meadow" the band return with another platter of intoxicating groove and fuzz drenched riffage, this time flying under the working title of "Kevlar,Kryptonite, Gloria"
The unassuming artwork of an industrial smokestack looming over suburban dwellings may fool the listener into expecting something a little stark and equally industrial from The Stone Eye's new album and although there are moments of starkness and indie flavoured industrialism to be found among the eleven songs presented here, the overriding impression is one of swaggering bluesy, stonerized, hard/classic rock. The Stone Eye for all their angsty posturing and fuzzy seriousness are, at root, a blues band, ok not your regular twelve to the bar blues band, but a blues band nonetheless. That they cleverly hide their blues roots beneath a mountain of fuzz, discordant noise and occasional indie flavoured acoustics is to their credit but every now and then the mask slips and those blues credentials peek through the smokescreens of indie melodies, grungy dynamics and stonerized distortion and show themselves in all their naked glory and when they do it is quite breath-taking. Overall The Stone Eye's "Kevlar, Kryptonite, Gloria" is a diverse and delightful album full to brimming over with solid musicianship and strong vocal performances and is packed to the rafters with songs that, thanks to strong songwriting skills and clever arrangements, are not reliant on just riffs to pull them through. The term "desert rock" came in to being thanks to bands like Kyuss, Unida and Yawning Man playing, impromptu gigs, called "generator parties", out in the surrounding deserts of their Palm Desert home base in the late 80's, since then the desert rock sound, a sort of hybrid of hard rock, punk, psych and Latin influences has spread wide and far and is now being played by bands who's proximity to anything even resembling a desert is probably a sand pit in their local children's playground. 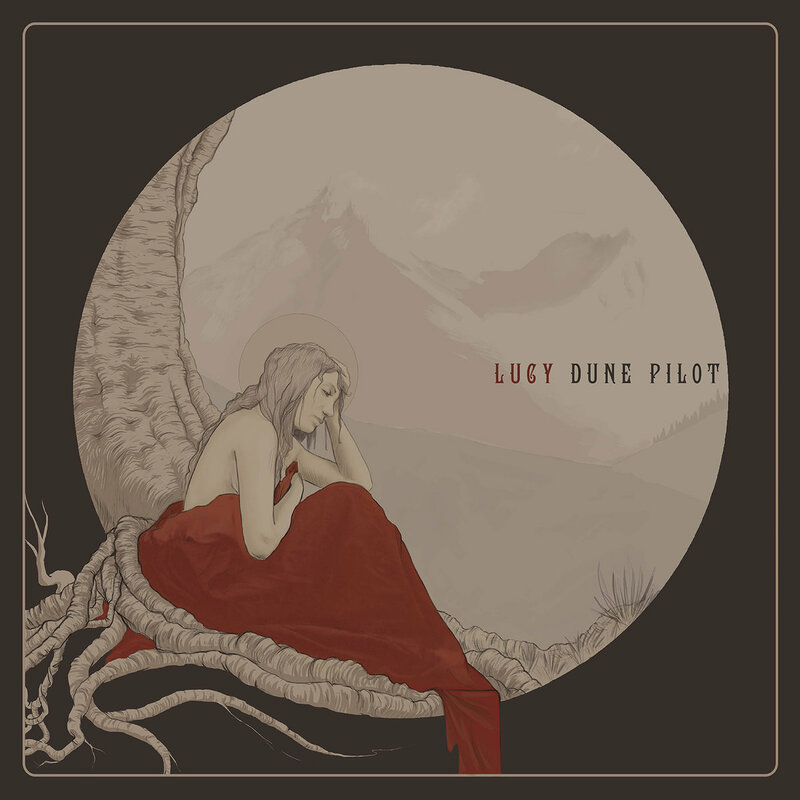 Munich, Germany is not exactly a vast wilderness populated by tall spiny cactus and sun bleached bones but four guys from that Bavarian capital, performing under the extremely apt title of Dune Pilot, sure know their way around a dusty desert groove, as can be witnessed on their latest release "Lucy"
The desert can be a cold and desolate place in its night time period yet deadly hot, humid and unforgiving during the day and although Dune Pilot's closest encounter with such a landscape has probably been via the pages of a copy of the National Geographic, left lying open in the waiting room of a doctor's surgery, the band have somehow managed to reflect those extremes in their raucous sandy grooves. Those hot and humid elements come through perfectly on songs like the barnstormin' opener "Loaded", the raucous, romping desert rocker "Postman", and the Sasquatch-esque "Speak Up" but the band are just as adept at delivering desolate and doomic, as can be witnessed on their more sedately paced tunes, such as the slowly building "Griper" and the schizophrenic closer "Feed Your Conscience", songs that balance the albums more aggressive moments with those of a more restrained and reflective vibe and give the albums overall impact a more rounded and immediate dynamic..
Superbly executed, with strong performances in both the vocal and instrumental departments, "Lucy" is an album that proves you don't have to live in a desert to be able to play "desert" you just need a little imagination and bucketful of groove. 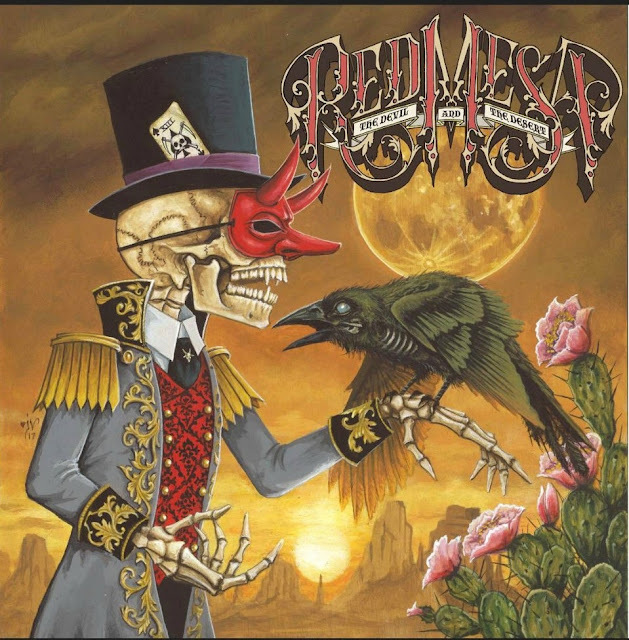 Red Mesa, the brainchild of Albuquerque, New Mexico based guitarist/vocalist Brad Frye, first tickled our senses with their 2014 self titled debut release "Red Mesa" a stunning debut that mixed subterranean doominess with large doses of dusty desert rock drive and southern rock swagger. Life, however, does not always run smooth when your in a band and after a while Frye found himself as the only remaining member of Red Mesa. With a slew of songs and riffs revolving around in his head Frye decided to carry on and with the help of Empty House Studio's Matthew Tobias on drums and with additional lap steel, guitar and bass contributions from John McMillian and Alex McMahon (and with the help of a crowd funding campaign) this makeshift band entered the studio, the result of which is a brand new album entitled "The Devil and The Desert". 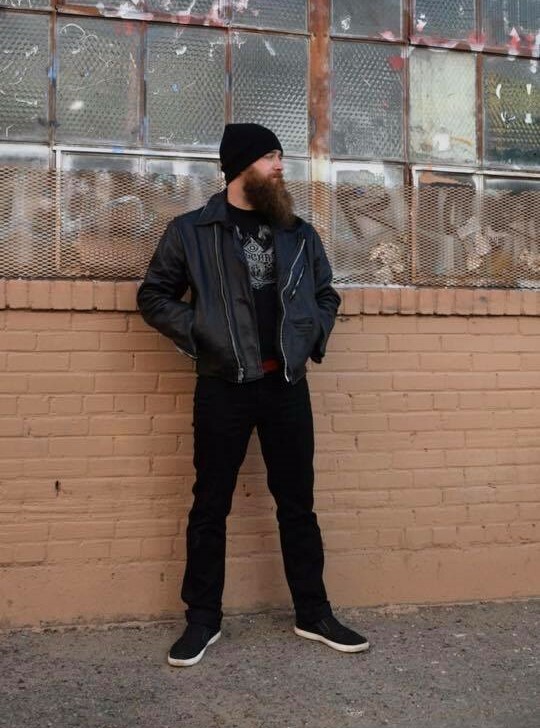 Acoustic guitar introduces first track "Devil Come Out To Play" followed by Frye's voice calling for the horned one to join him in revelry, the guitarist/vocalist's voice distinctive and clean tinted with a pleasing drawl asking, pleading for the Lord of the Flies to "take my blues away". This one song alone sets the tone for the rest of the album and signals a whole shift in direction from the proto-doomic bluesy bluster of the bands previous album. Where "Red Mesa" took it's lead from the more raucous end of the stoner/hard rock spectrum here we find Frye toying with a more refined and down home dynamic, still rooted in the blues but with a more country/Americana edge, Frye even going as far as throwing in some jazzy fusion like colouring on the beautiful "Springtime In The Desert". This is not to say that Red Mesa have totally abandoned their more raucous roots as can be witnessed on the gritty blues drenched "Sacred Datura" and the swaggering hard rocker "Route 666", it is however on those songs with a more sedate and restrained groove like "The Devil's Coming 'Round" and the eastern tinted "Desert Sol" that this collective really shine. Having said that it is the more doomic and dark title track "The Devil and The Desert" that is the highlight of the album, Frye's vocals here taking on a gruffer, throatier tone as he rages over a dark backdrop of doomic groove, underscored by grumbling, growling bass and thunderous, pummelling percussion, a groove around which Frye also weaves swirling lead lines and crunching riffage. Even here, with the band hitting their darkest and dankest groove, Frye cannot help but throw in a lysergic and heady mid-section to keep us bewildered, bemused and on our toes. "The Devil and The Desert" is a brave and courageous album especially when you consider, that after releasing such a well received debut, Frye could easily have taken the easy route and followed up with just more of the same, thankfully Frye opted to take a different path which has resulted in a more rounded and more complete release which will appeal to both those already familiar with his previous work and those coming to it anew.